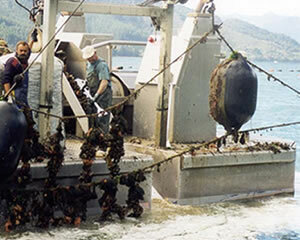 Practical models are required to help manage aquaculture production, including the effects of aquaculture on wider ecosystem services, towards internalisation of wastes within multi-trophic systems, each according to the European Union Water Framework Directive and Food and Agriculture Organisation’s guidelines for ecosystem approach. However, models to date in general lack detailed representation of critical hydrodynamic effects in and around aquaculture, whether suspended or on the bottom, thus without sufficient spatial resolution to be useful on an individual farm scale. In addition, inadequate representation of the drivers of shellfish growth, especially the detrital component of suspended food (seston), including evolutionary differences between the relative ability of separate species to utilise that detrital component, has limited such models (Hawkins 2012, 2013 b). To help address these and other shortcomings, ShellGIS has been developed as a custom application of STEMgis, a geographic information system (GIS) that handles additional dimensions of time and depth, within which we have embedded state-of-the-art models that account for interactive effects of culture type (i.e. suspended or bottom), shellfish density and hydrodynamics, as mediated through consequences for food supply, seawater temperature, salinity, seawater oxygen saturation and any aerial exposure. Those models include ShellSIM (Hawkins et al. 2012, 2013 a, c), MIKE 21 (Warren et al. 1992) and FLOW 3D (Sicilian et al. 1987). The result is a transferable desktop-based software tool which, for choice of 14-commonly cultured shellfish species, enables dynamic predictions of shellfish production, environmental effects and profitability according to culture practice and site selection within given GIS domain (Newell et al. 2012 a, b, 2013 a, b, c, d).